Otello is arguably one of Verdi’s greatest operas with a very complex and dramatic score. I say ‘arguably’ because some critics and scholars are of the opinion that Verdi’s last operas (Otello and Falstaff) suffer from a certain uneasy intellectualism. Personally, I believe they are the climax of the Italian operatic tradition, especially Otello. The libretto written by Arrigo Boito is of course drawn from Shakespeare’s famous play Othello. Some of the characters are memorable, especially Iago who has to be one of the greatest villains ever created – manipulative, malicious, cynical and duplicitous. Boito followed Shakespeare’s play very closely except for Act I, which he omitted. It is said that to start with, Verdi was unsure whether he still had the energy required to bring such a major work to the stage. It took him approximately two years to compose – December 1884 to November 1886. The opera was then premiered on 5th February 1887 at La Scala in Milan. Otello is not the easiest of operas to stage and produce. It requires extraordinary singers who are also outstanding actors, owners of excellent voices and capable of conveying the drama in a convincing manner. There are not many tenors who can reach the heights of some of Otello’s notes and at the same time express the drama and jealousy, but also the tenderness and ultimately the tragedy of the character. The same goes for Desdemona, a role which requires not only a beautiful, rich and expressive voice but also someone who can portray the innocence, the purity, the gentleness and warmth of the character, as she is the innocent victim. Equally Iago has to be an exceptional baritone and a superlative actor, as he must be believable both as Otello’s best friend and the devilish, evil manipulator. The present CD hits “all the right notes”, in more ways than one, and singers don’t come much better than the ones on offer here. This is a historical recording of a performance from a run of Otello at the Metropolitan Opera in New York. It was a matinee, broadcast live on the radio with some of the most celebrated singers of the day. It is legendary and has rarely (perhaps never) been bettered. This CD is the remastered recording of that famous live broadcast from the Met on 8th March 1958, featuring Mario del Monaco as Otello, Victoria de los Angeles as Desdemona and Leonard Warren as Iago. All three of them were highly acclaimed worldwide and at the top of their powers in the 1950s and ‘60s. Some critics of the time rebuked del Monaco’s tenor as unsubtle, possibly because of the extraordinary power of his voice and the fact that he tackled his roles with complete dedication and sincerity. Whatever one’s opinion of del Monaco in general, he is terrific as Otello in this recording. His voice is not merely powerful, it emerges as an expressive instrument of rare dramatic intensity. Through his voice, we understand Otello’s jealousy, his power and naivety, his failure to recognise Iago’s betrayal of his trust and friendship, and finally his tragic ending. Victoria de los Angeles is also outstanding as Desdemona and although we can’t see her, we can imagine the sweet, innocent Desdemona and her sadness. Her tone is lovely, pure and crystal clear, soft, tender and fragile. One feels with and for her; wants to help and save her from the intrigue orchestrated so malevolently by Iago. Leonard Warren, a baritone who was a leading artist at the Met for several years, is also in exceptionally fine voice in this recording and delivers a solid, insinuating Iago though he is not as expressive as del Monaco and de los Angeles. His performance would probably benefit from the visual aspect, while del Monaco’s and de los Angeles’s are impressive enough through the power of their voices alone. The minor roles are all strongly performed, with some very fine singing, especially from Paul Franke as Cassio and Rosalind Elias as Emilia. The orchestra and chorus of the Metropolitan Opera are exemplary throughout and conductor Fausto Cleva manages an ideal integration of the orchestra as part of the drama on stage, underlining the voices beautifully without ever overwhelming them. The CD notes venture that, and I’d tend to agree, the explanation as to why Cleva achieves this is that “he had a long association with singers behind the scenes” and therefore, “is able to create the right musical fabric with the orchestra…to give the singers the support they need”. The sound quality of this recording is first-rate and I must admit I was surprised. There are many recordings of the time where – even after having been cleaned up and transferred to a CD – the sound is a little muffled, as if the singers had a cold and the orchestra covered their instruments with handkerchiefs or towels. This is not the case here, perhaps because it was originally a live radio broadcast, or because the remastering by Andrew Rose was exceptionally well done. Whatever the reason, the point is that the recording is excellent and clear, which contributes to the enjoyment of the listener. 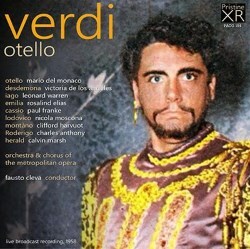 The packaging is attractive, with a cover photograph of del Monaco in his costume and make-up as Otello. The booklet notes (if one can apply that term to one short page on the back of the cover) are in English only and although interesting are rather brief. In my opinion, the final CD product would have benefited from a larger booklet that would include information about the production and artists’ biographies. Mario del Monaco made many appearances as Otello, especially during the 1950s, and he was at the height of his powers at this point in time. His performance in Otello at the Met in March 1958 counts as one of his best. He sang the part (which became one of his signature roles) many times at the Metropolitan Opera and throughout European opera houses, making two recordings of the work for Decca. As for Victoria de los Angeles her appearance as Desdemona at the Met was a rare event. She performed the role there only four times and was better known in New York for her performances of Mimi (Puccini’s La bohème), Butterfly (Puccini’s Madama Butterfly) and Marguerite (Gounod’s Faust). For this alone the recording would be worth listening to but there are many more reasons. It is a historical recording of rare quality, with legendary performances. Whether Verdi’s Otello is your thing or not, this CD is a little gem to be enjoyed over and over again.